After a wonderful day sailing in Glacier Bay National Park, we called into Bartlett Cove Ranger Station to see a memorial to a very special humpback whale called Snow. Being permitted to dock here was yet another advantage of being on a small ship; the big cruisers can’t come here… the bay is not deep enough, the pontoon jetty is not big enough for them and the small public area around the Rangers Station and Snow’s memorial just would not cope with thousands of cruise boat passengers at a time. So what was special about Snow? In July 2001, Snow, a 44 year old female hump back whale was killed in Glacier Bay by a large cruise ship. Not intentionally, of course. Snow, named for the white spots on her tail, was a favourite of the park rangers. They’d tracked her each year since 1975 as she returned from her long migration to the south. They knew her well… and all of her babies. As our ranger told us the sad story of Snow and her untimely death, I realised that this story had a special significance to me. I’d heard it before. I was here, sailing in this area on a cruise ship shortly after the drama of Snow’s death began to unfold back in July 2001. I’d been sailing down the coast from Anchorage on a large cruise ship and I was really looking forward to sailing into Glacier Bay; a definite highlight of any cruise in Alaska. However, we weren’t permitted to enter… no ship was. Snow had been killed a couple of weeks earlier and all ships were barred from entry for quite some time. And that was one reason why I’d come back to the Inside Passage this time… to visit Glacier Bay. Now I had a chance to honour this whale and visit her very special memorial. Snow was 14 m (45.5 ft) long and weighed 35 ton. These are BIG animals, as you can see from this photo of park personnel beside her beached body. Snow’s body was left to decompose on the beach for 15 months. Her bones were then soaked in the ocean and later moved into compost pits to allow nature to help clean them. All of this took a great deal of work but many students and community volunteers donated hundreds of hours to help the rangers of the National Park Service. The bones were then transported to the east coast of USA to be properly cleaned and preserved. A settlement with the cruise line that had killed Snow, helped provide the much needed funds. 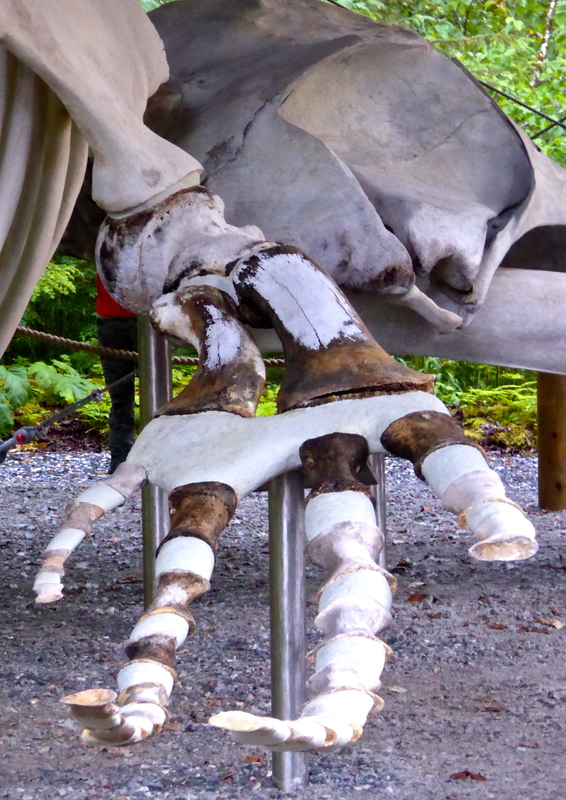 Now Snow’s bones form the world’s largest hump back skeleton display. She ‘lives on to teach the world about whales’. The memorial is an amazing example of how tragedy can be turned into triumph. There are many signs around the memorial that teach more about these humpback whales which visit Glacier Bay every summer. The whales come from either Hawaii or Mexico. To get to Glacier Bay they travel 4025 kms (2,500 miles), the journey taking them 5 to 6 weeks. They arrive back in Alaska very hungry since they eat little while in their summer mating and calving grounds. The nutrient rich waters of Alaska provide a virtual ‘all you can eat’ buffet for whales. We had been privileged to spend hours watching them feed in several places during our journey through the Inside Passage. One of Snow’s legacies is the stricter rules that govern visits to Glacier Bay. Now the park service strictly limits the number of ships permitted to visit each day. Speed limits are also imposed and the approach distance between ships and whales are strict. Now the whales can swim and feed in peace… and visitors can once more enjoy the natural wonders of Glacier Bay National Park. There was one more story our ranger told us about Snow. When the memorial was opened, the park service invited an elder from the local Tlingit tribe to welcome Snow back. At the same time as this ‘service’ was being held, the guests were amazed, and very moved, to see some whales come close into Bartlett Cove as if to welcome her back, too. I was so glad that I was able to visit the memorial and glad, too, that I’d finally been able to visit Glacier Bay. It had been a very special day. But there was still just time to go for a short walk in the forest area behind the ranger’s quarters before leaving Bartlett Cove. 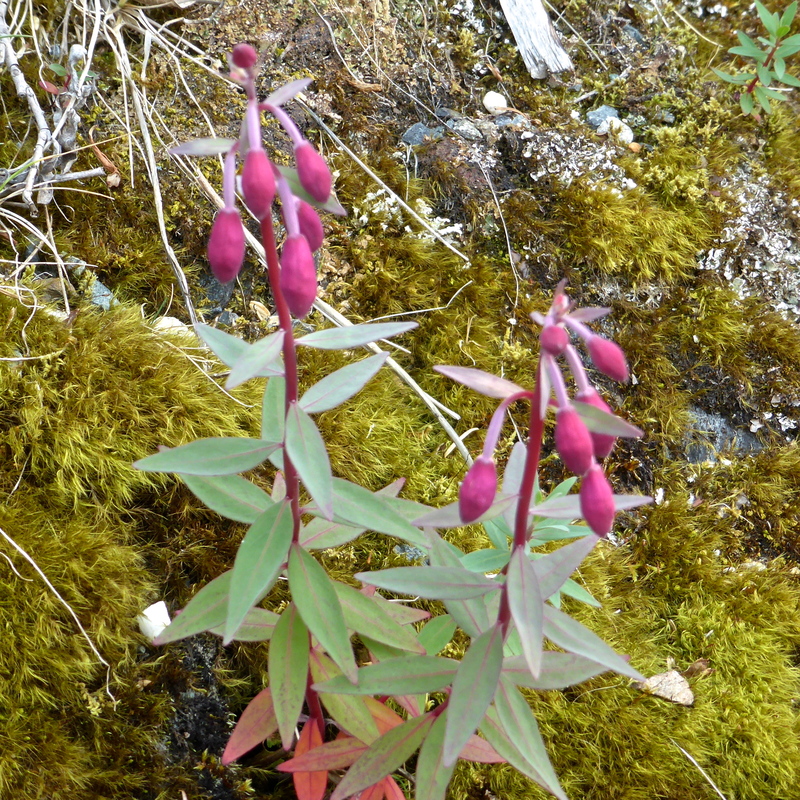 Pyrola asarifolia, the Pink Wintergreen, is the largest of all the Wintergreens in the Tongass Forests. David found most of the others on his other walks. Sanguisorba canadensis ssp. 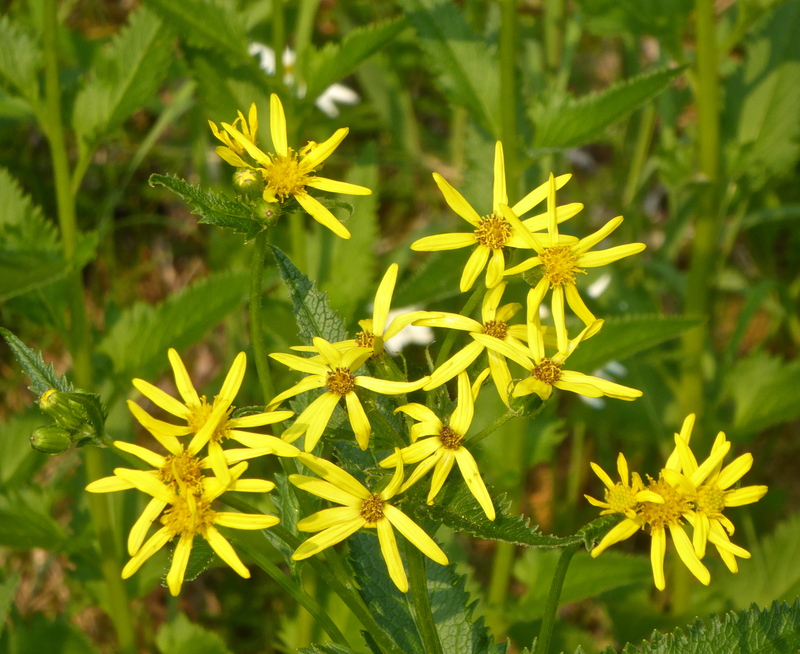 latifolia, is known as Sitka Burnett or Canada Burnett. It’s one plant not seen before on any of the other walks. This is a most unusual flower. 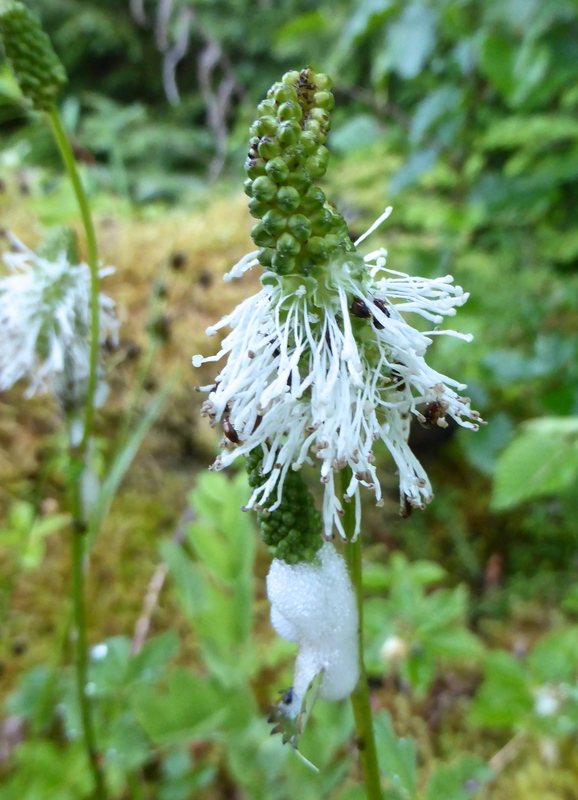 It has no petals; just long white sepals arranged around a cylindrical head. Sanquisorba refers to the fact that a concoction made from the roots have been used to stop both internal and external bleeding. 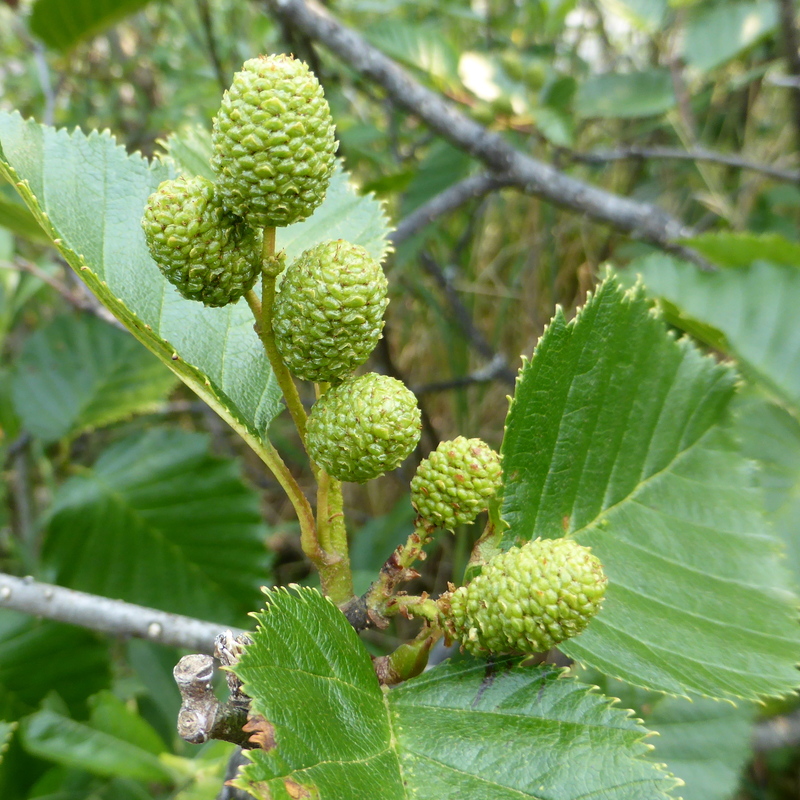 Even today, herbalists recommend that the leaves can be made into a herbal tea. The leaves are referred to as being palmately compound; as you can see, they radiate out from a common point and are not all the same size. 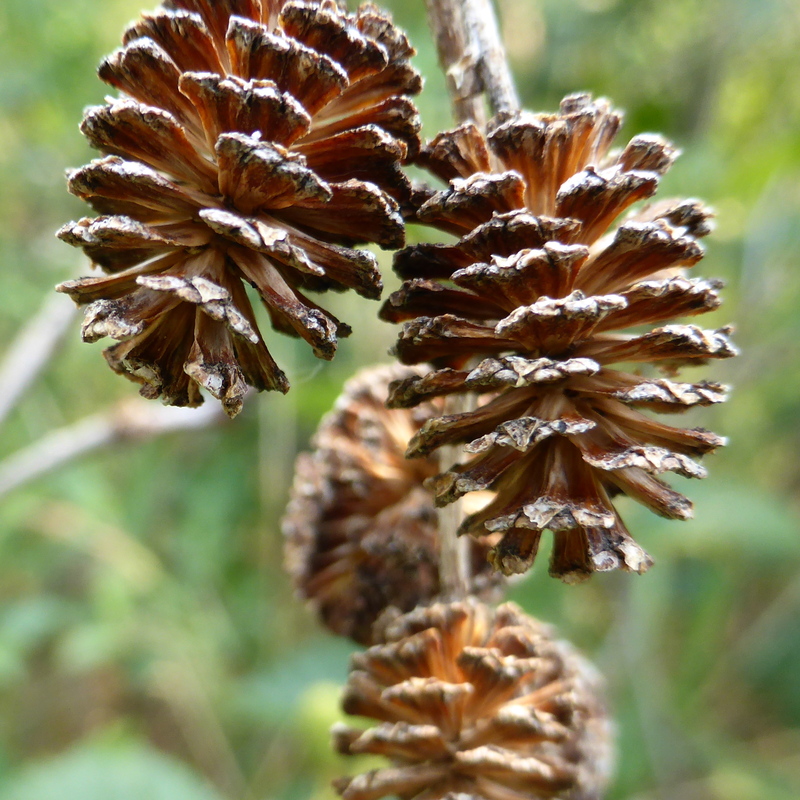 The plants die back in winter and are thus able to survive the harsh, cold winters. On the pond were some beautiful flowers and leaves of Nuphar polysepalum also known as Yellow Pond Lily, a common name that one might expect. 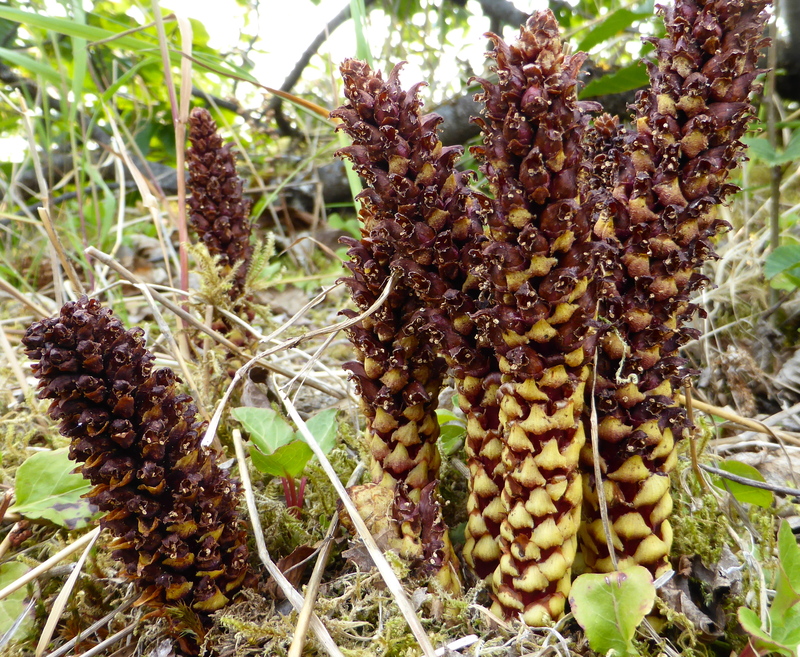 But its other local name is rather more unusual: Spatterdock Cow-lily. A robin hopped around on logs among the lilies, insect catching , no doubt. Various lichens and mosses adorned both rotting logs and rocks. 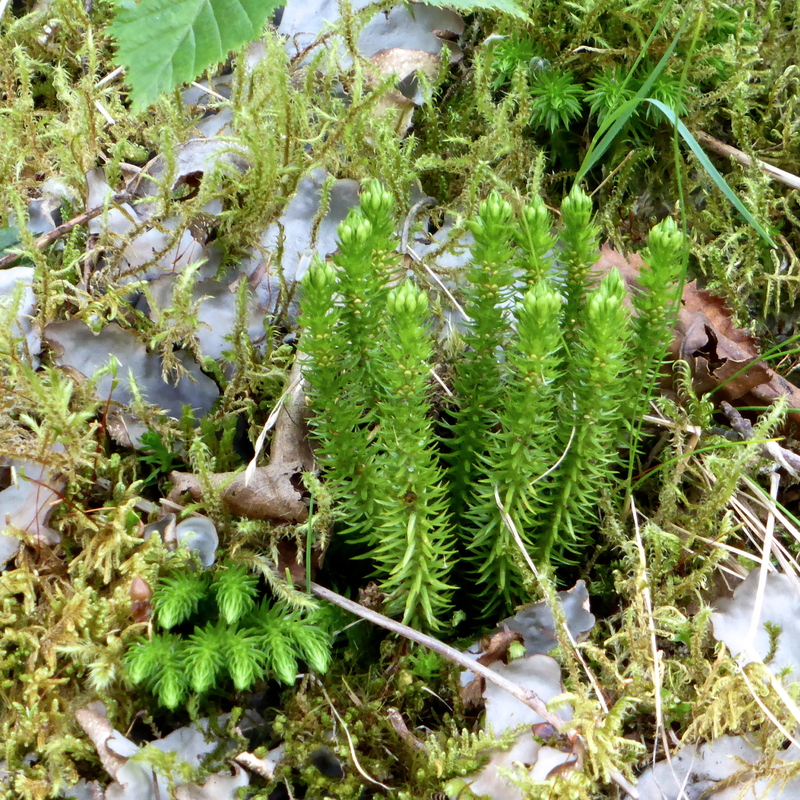 Equisetum sp. 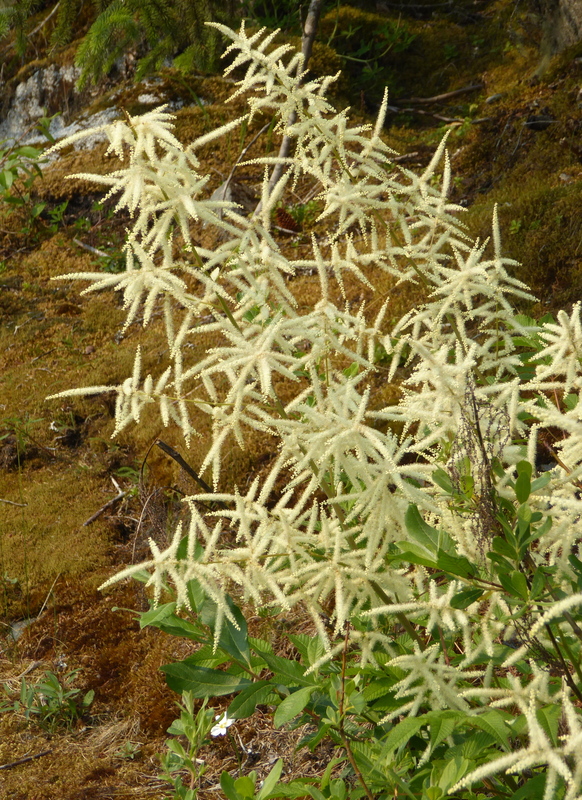 is a strange looking, but quite striking, small bog plant. 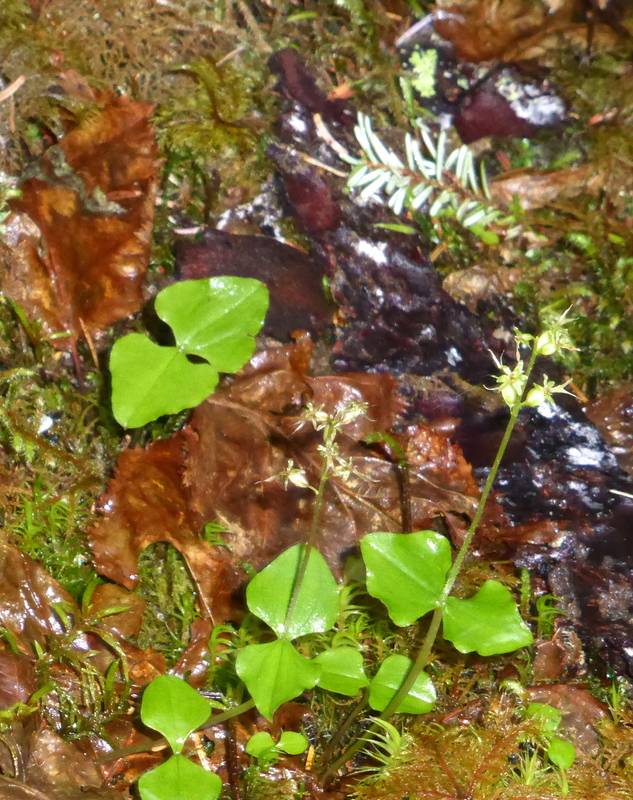 The tiny white flowers of Listera cordata hold their heads high on stalks above their heart shaped leaves… which give the plant its common name of Heart-leaved Twayblade. 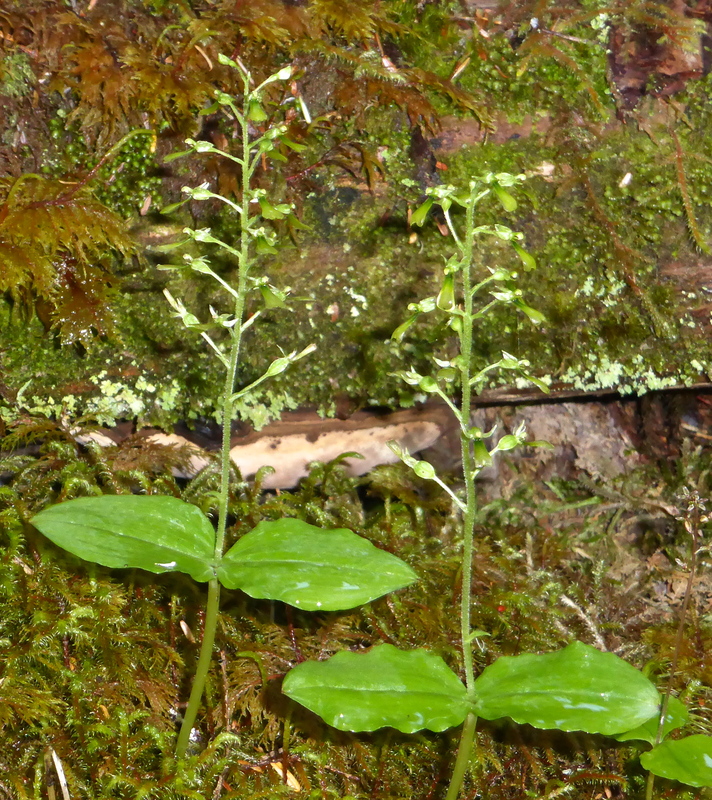 The Northwestern Twayblade, Listera caurina, has different shaped leaves. All of these plants grew around this small pond and bog. It was quite lovely in the evening light with the forest reflected in the dark, still waters. On leaving the forest, David noticed this eagle Tlingit totem carving. Tlingit totem art takes many forms. This was on a poster back near the dock. Darkness was closing in as we made our way back to the dock. ‘Sea Lion’ was waiting to take us to our evening anchorage outside of the National Park, to an area where we’d be able to take one last walk in the Tongass Forests.